It’s that time of the year, friends! 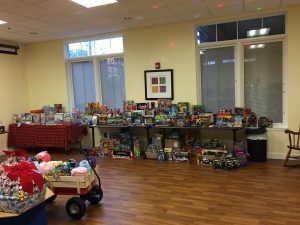 We are currently collecting new, unwrapped children’s and teen toys for Ronald’s Workshop at Ronald McDonald House Charities of Alabama (RMHCA)! The families who stay with us have often traveled the farthest and have the sickest children. We don’t want them to worry about how they will provide gifts for the holidays — so that’s where you come in! Donations of unwrapped, new gifts can be dropped off at RMHCA by appointment through December 15, 2017. Please contact Director of Family Programming April Dickerson at april.dickerson@rmhca.org to schedule a drop off time. Once Ronald’s Workshop is filled, parents can “shop” for their children at no cost to them. Volunteers will then wrap and hide the gifts for Santa to deliver in time for Christmas! Click here to open a copy of our Ronald’s Workshop flier that you can print and post at your office or church.